My youngest daughter has just entered the age when she is now able to attend the local story hour that involves making a craft. Week after week we will attend until the amount of painted and glued projects she has creatively designed rival that of the most prolific artist and, of course, her siblings. Even without her new additions, I have accumulated more pieces than the Smithsonian and the Louvre combined with two older children who are story hour and preschool graduates. And each piece of art is something special, something unique, and something truly and honestly kid produced. With their own tiny hands, they have concocted some of the world’s most disturbed art and not wanting to throw anything away, I have turned to slathering the walls of my basement stairs with their projects. We’ve got pumpkins with more glitter than pumpkin. There’s a cutout of one of the kids (not sure which one) that has one giant eye and one tiny one, like it’s winking at me each time I go downstairs. There are owls and flowers that strangely look identical, and a few that look like owls and flowers and are definitely not. My most favorite piece of art, however, is one that my two older children worked on together, as a team. They were given shapes of construction paper and glue sticks and I gave them basic instructions on how to assemble a beaver. 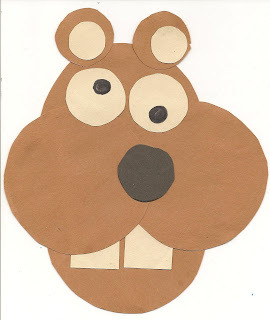 Chubby cheeks, buck teeth, and cartoonish eyes, the beaver should have been adorable. It’s amazing how placing pieces off-center can really change the look of an animal, losing the all important laws of symmetry. This poor beaver had eyes at two different levels and eyeballs pointing in very unnatural directions. Its mouth was way too high and its teeth way too long. From any angle you looked at the critter, you swore it was going to come to life, chew off your nose, and give you rabies. And it was beautiful. Because they made them themselves. And I tuck my buck teeth back into my lip because yeah, if I made a piece of art designed for the ability of a two-year-old, it’d be pretty awesome, too. Instead, I stand back and proudly let my children scribble their names backwards if at all, and have their way with their art. My daughter’s first art project at the library is a fish. The tail is glued together completely wrong and is positioned more like a dorsal fin. The fish itself, fashioned from a small paper plate, looks like it swam through a body of water recovering from an oil spill. Blue paint is involved, but not in any way that it really was intended, and what was once an eye has now been replaced by a big blob of dried glitter. It goes without saying that our blind, oily, propellerless fish now hangs proudly in the hall of crazed animals, front and center, just as it should be. Only this one doesn’t wink at me when I go downstairs, and I’m quite thankful that fish can’t have rabies.